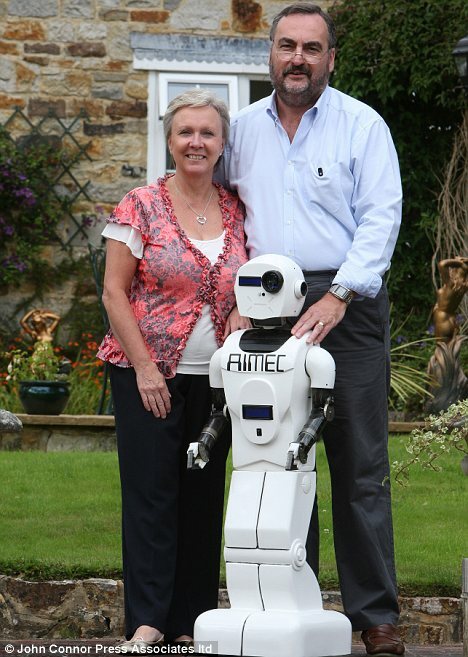 Mr Ellis has created dozens of mechanical and digital toys that have been enjoyed by millions of children worldwide and hopes to develop prototype Aimec to be the first commercially viable, affordable and useful home robot. He believes recent technological advances have brought us closer to having robots which can properly interact with their owners and even do household chores. ‘In 10 years every home will have a robot. They will help mow the lawn, cook, clean the house. The potential applications are endless. Mrs Ellis, 53, who used to work in a bank, came on board as work picked up and comes up with many of the ideas for new toys. She said: ‘We work extremely hard, from 7.30 in the morning until late into the evening, with only short breaks for lunch and dinner. The couple’s biggest commercial success to date, Cube World, sold in its millions worldwide when it was launched in 2005. To prove his point, he asks Aimec to do an impression. ‘But it’s against my programming to impersonate another robot,’ jokes Aimec, in a send-up of Star Wars’ famous robot C-3PO. Taking a microphone in its claw, Aimec starts singing lines from the 1981 novelty hit by Hitchhiker’s Guide’s Marvin the Paranoid Android. ‘What is the meaning of life?’ Mr Ellis asks. 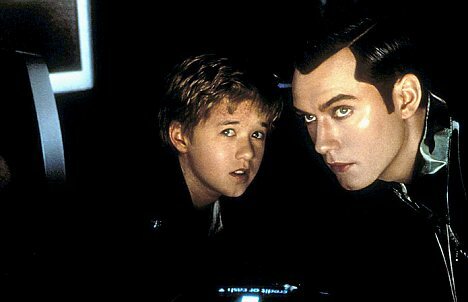 Aimec doesn’t hesitate, ’42’, again from radio TV series Hitchhiker’s Guide to the Galaxy, based on the cult Douglas Adams book, a clear favourite with young robots. ‘Can you speak Klingon?’ Mr Ellis asks. ‘Lets have a quiz,’ says Mr Ellis. ‘Um, 14?’ Mr Ellis guesses. Mr Ellis says: ‘The technology really surprises me sometimes. You can talk to Aimec about anything at all. It is connected to the internet, by wireless, so it just looks up stuff it doesn’t understand online. Aimec interrupts to read the news headlines it has just picked up from the internet before giving an impromptu Karaoke show. 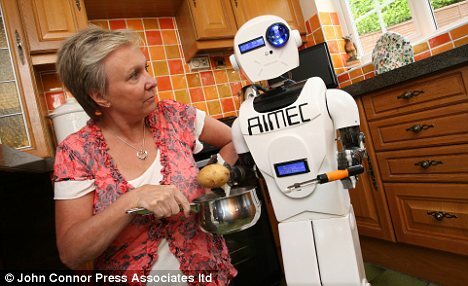 ‘Aimec is a really great toy,’ Mr Ellis says, ‘but it’s not the finished article. I’m already working on Aimec 4, which will have face recognition. That means it will be able to identify a person from the unique geometric pattern of their face. ‘Vision is really the holy grail in robotics. Once a robot can see things and identify them, it will be able to do really useful things. Like get a beer from the fridge. So is it a matter of time before robots take over? The inventor laughs. ‘No. That’s not going to happen. But I did learn an important lesson early on – always put the on-off switch on the front. ‘When I built my first robot, Herbie, in 1979, it didn’t actually have an on-off switch, if you can believe that. One day it was serving drinks in the living room, and it suddenly went beserk. Just like a real child, Aimec 3 does finally slow down when its energy levels start running low. Seeing the robot is tiring, Mr Ellis tells his creation to shut down.